Every room is unique. 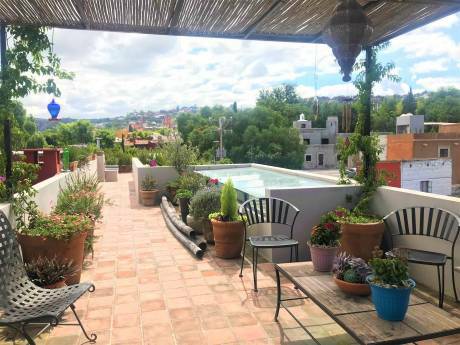 Depending on mood and weather, you can cozy up in a cool shady retreat, relax to the sound of our fountain in the plant-filled patio, or eat dinner in the kitchen---complete with a close-up view of one of Guanajuato's signature churches. The ground floor is self-contained for guests, with its own bathroom, fridge and two-burner stove. We are a couple in our 60s who enjoy the contrast of living in both Northern California and Guanajuato, Mexico. While we love Mexico, we also enjoy exploring back roads in our Eurovan, and visiting other parts of the world, where we frequently do long-distance walks or bicycle tours. When we're not on the road, Barry is a science writer and Louisa is a leadership consultant and trainer. 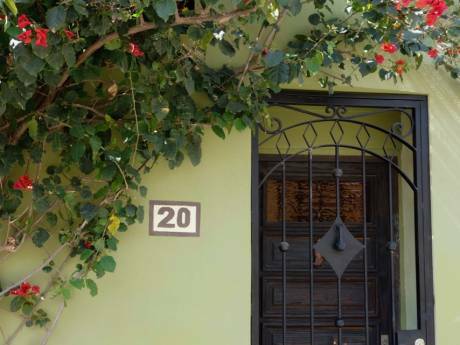 Our home is in "el centro," five minutes walk from shops, cafes, schools, and other necessities. Yet we are on a quiet ("muy tranquillo") pedestrian-only street. We don't have a car in Mexico and don't need one: taxis are cheap and long-distance buses are comfortable and economical. Guanajuato is a United Nations World Heritage site: it's a jewel of colonial architecture, made particularly accessible because much of the traffic is underground in tunnels, so we have many pedestrian-only streets. The city has a whole arrays of museums, historical buildings/churches, statues, ex-haciendas and gardens. 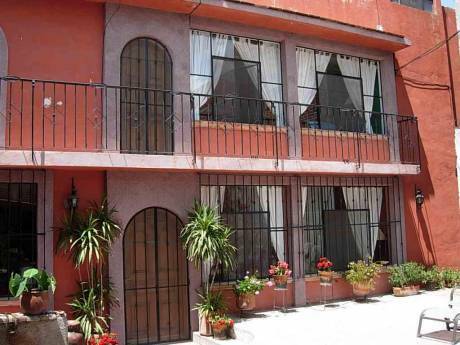 Diego Rivera was born here and his (and Frida Kahlo's) museum houses his memorabilia and art. Mariachi bands are out every day, plus three "tuna" groups lead tourists through the back alleys every evening, playing traditional music as they go. 32 Friday evenings a year, the Sinfonica of Guanajuato plays classical music, often with guest artists and conductors from Europe. You can be in the hills which surround the city in 20 minutes walk (uphill!) from our home. We can recommend many lovely hikes, and our wonderful house-cleaner, Mari, is also Guanajuato's best guide to the hills. Close by are two more United Nations World Heritage sites: sophisticated yet charming city of Queretaro, with its colonial architecture and plazas; and San Miguel de Allende, an artist haven and retirement home for many ex-pats. Leon/Guanajuato (BJX) airport is less than 30 minutes by taxi ($25 fare) with direct flights to many Mexican and U.S. cities. Mexico City airport is 5 hours away by luxury bus ($35) with connections to the world. Local excellent medical and dental care is available. The University of Guanajuato attracts students from all over the world. Also, many people come to Guanajuato to learn Spanish either at the university or at one of the many private language schools. Classes are flexible and very economical. We can also recommend a wonderful private Spanish tutor who comes to our home.